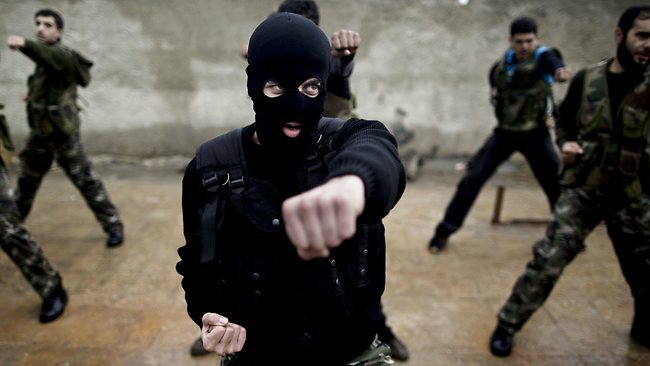 Free Syrian Army | Hayat Alvi, Ph.D. The Islamic State of Iraq and Sham (ISIS) accidentally beheaded one of their own commanders recently. 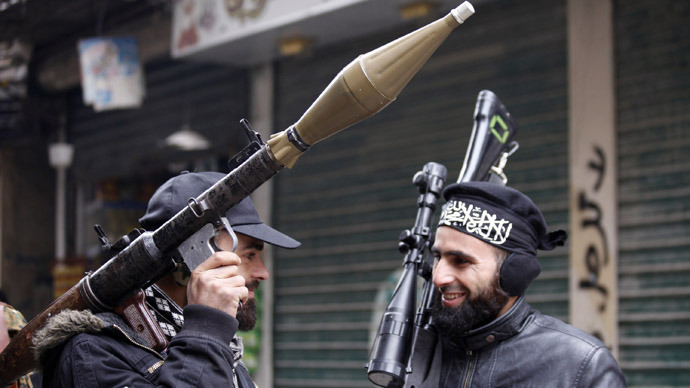 Meanwhile, jihadist rebel groups have been fighting against the secular or more moderate Free Syrian Army forces, as well as against Syrian Kurds. Now, a group of Islamic rebel forces has announced a merger: “A statement posted online said Ahrar al-Sham, Jaysh al-Islam, Suqour al-Sham, Liwa al-Tawhid, Liwa al-Haqq, Ansar al-Sham and the Kurdish Islamic Front had agreed to a ‘gradual merger’. It said the new Islamic Front will be an ‘independent political, military and social formation’ to topple the Assad regime and build an Islamic state” (BBC News, Nov. 22, 2013). Throw into that mix Shia fighters in Assad’s camp, including Hezbollah, Iranian Revolutionary Guard Corps (IRGC), and other pro-Shia Islamist militias, and now we have a full-fledged complex multidimensional sectarian war vying for a dominant Islamism to take hold of Syria. In sum, Syria embodies multi-layered “spiders web-like “ networks of Sunni and Shia militias and paramilitary forces, and this can only continue to plunge Syria into violence and chaos not unlike the Lebanese Civil War (1975-1990), although Syria’s war is at least a hundred times worse and intense and potentially will last a lot longer. 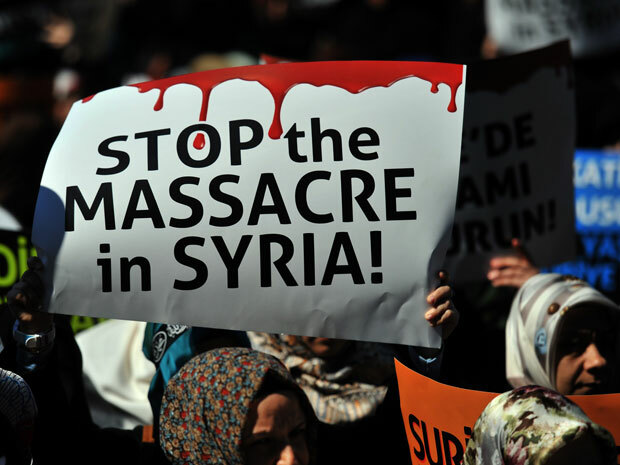 The supporters of these proxy rebel groups, like Saudi Arabia, the UAE, and other GCC states on the Sunni jihadists’ side, and Iran on the Shia side, have no regard for the innocent civilians suffering horrifically in Syria and also as refugees in neighboring countries. These proxy supporters are as guilty of atrocities as Bashar al-Assad. All sides are guilty of war crimes. I have called the Syrian civil war the “Afghanistan of the Middle East.” I would love to be proven wrong about that, but this merger of Islamic rebel groups and the power struggles between the Islamic Front and the Al Qaeda-affiliated jihadist groups portend a similar outcome to Afghanistan after the Soviets withdrew. The war of Islamisms is nothing new, especially in terms of the sectarian rivalry between Sunnis and Shias. That’s as old as Islam itself. Now, we see the power struggles in the post-Arab Awakening Middle East and North Africa consist of all shades of Islamists trying to climb over each other for the seats of power. This is all at the expense of civilians, both Sunnis, Shias, Christians, and secularists. Those waging the war of Islamisms seem to fail miserably in grasping that concept. Hayat Alvi, Ph.D., is an Associate Professor at the US Naval War College. The purpose of a military airstrike against Syria is to “deter Assad from using chemical weapons, to degrade his regime’s ability to use them, and to make clear to the world that we will not tolerate their use.” So the goalpost has moved, from what was once the “Responsibility to Protect” civilians from mass atrocities – known as the R2P principle – which was implemented in the Libya 2011 NATO campaign, to now the use of chemical weapons. Down the road, will the goalpost shift yet again? President Obama possesses “the authority to order military strikes,” yet he felt the need to respect U.S. democracy and take the debate to Congress. That means that he is making gestures toward Congress for political legitimacy at the domestic level for military strikes against Syria, but leaves open a huge window to employ his executive authority to order the airstrikes, with or without that political endorsement. This raises the question of whether or not the airstrikes, if and when they are carried out, will be defined as “war.” The War Powers Resolution imposes certain parameters on the President, once he engages in military actions in the context of (conventional) war, understood as deploying troops on the ground. 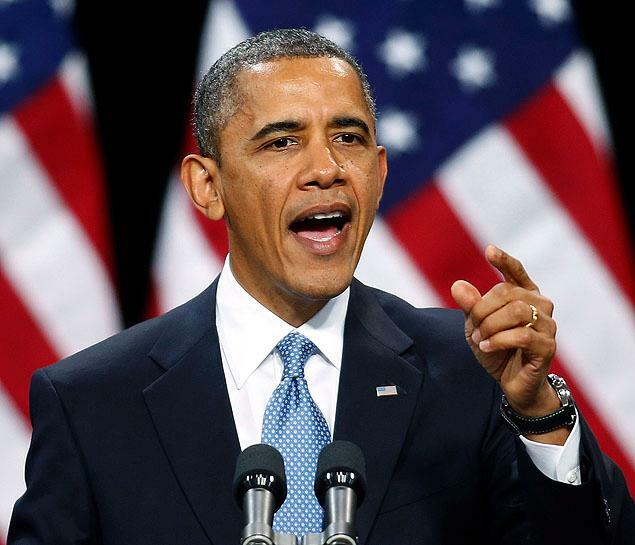 Given that President Obama has promised not to put troops on the ground in Syria, that might allow the military airstrikes to sidestep the definition of war, as was the case the President made with the Libya campaign. NATO led that campaign against Qaddafi, which allowed the President to say that the U.S. is not engaging in a war; it is carrying out cooperative engagement within the framework of NATO, without troops on the ground, and without the intent of regime change. We know how it ended for Qaddafi, nonetheless. President Obama asked every member of Congress and viewers at home to watch the videos of the August 21st chemical attack. He uses the word “children” seven times, and “infant” and “our kids” also added in his speech. Clearly, he is appealing to the audience’s compassion and humanitarian sensitivities and ideals. It’s an emotional appeal for reserving the U.S. right to carry out airstrikes against specific targets inside Syria, which may in turn lead inadvertently to more chaos and civilian deaths. Diplomacy engines are working hard, and the ball was lobbed into Russia’s court. Russia responded by saying they would be glad to oversee the removal of chemical weapons from Syria. The ball is now back in the U.S. court. President Obama is giving diplomacy a chance. But, at the same time, the President unequivocally maintains that the U.S. has the military standing by to continue to apply pressure on Assad, and act in the event that diplomacy fails. He said that, “We cannot resolve someone else’s civil war through force, particularly after a decade of war in Iraq and Afghanistan.” The U.S. responsibility for actually triggering civil war, arguably in Iraq following the troops pull-out, and potentially after the 2014 pull-out from Afghanistan, is not mentioned or addressed. Anyone who has watched the film or read the book, Charlie Wilson’s War, learns that after the Soviets withdrew from Afghanistan, the U.S. packed its bags and left the Af-Pak region, despite Representative Wilson’s pleas for U.S. investments in Afghanistan’s postwar education sector. The moment that happened, Afghanistan descended into civil war. This also conveys the lesson that once a country enters a war, the chaos and instability does not end after the ceasefire or peace takes hold, or the core objectives of that country are achieved. Chemical weapons use is not tolerated. But, killing civilians by conventional means since 2011, with a death count beyond the 100,000 mark, is unchallenged. The poison gas sarin is mentioned a few times. While some analysts have said that rebels could not have deployed chemical weapons because it requires sophisticated technology, no one has mentioned the Aum Shinrikyo sarin gas attack in Japan’s Tokyo subway in 1995. The cult, Aum Shinrikyo, coordinated five attacks on the Tokyo subway, killing 13 and injuring fifty severely. President Obama said, “Al Qaeda (AQ) will only draw strength in a more chaotic Syria if people there see the world doing nothing to prevent innocent civilians from being gassed to death.” Who’s to say that AQ can’t still get its hands on some chemical weapons? By the way, many argue that U.S. airstrikes will actually intensify the chaos in Syria, not alleviate it. One of the take-aways from the President’s speech tonight is that this issue or crisis will drag on for much longer. Diplomacy is a slow process; civilians will continue to die; waves of refugees and internally displaced persons (IDPs) will continue to flow within and outside Syria; and all the while the clock is ticking for Russia, Syria, and Iran to finalize the proposed deal with the U.S. with some U.N. involvement. That will take a long time, and all the efforts might still come to naught. Will the U.S. military remain mobilized while the clock ticks? President Obama says yes. Will important, pressing American domestic issues be addressed and resolved, like the debt ceiling, the budget, Sequestration, Obamacare, and the health of the economy in general? If the Syria crisis remains in crisis status in the eyes of the U.S. President and Congress, then we can be assured that those pressing domestic issues will be placed on the backburner, and kicked down the road. The most important component of the Obama plan and strategy is the word “deterrence.” If chemical weapons are dismantled and removed out of Syria, then what? 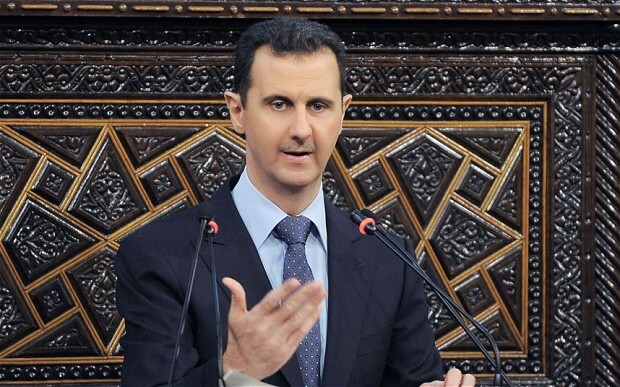 Will that deter Assad from killing his own people? Not likely. If the U.S. carries out the airstrikes against Syria, will this action deter Assad from killing his own people? Not likely. The targeted strikes might degrade Assad’s capability to use WMDs, but certainly he will not wave a white flag and declare a ceasefire. He might even try to crush the resistance even harder. A big picture, long-term vision in the plan and strategy for Syria must be considered, for not just deterring Assad from using WMDs, but for comprehensive, sustainable conflict resolution. The U.S. must illustrate that the goalpost remains at R2P, and not a new yardstick, or “red line,” of civilian suffering only by use of chemical weapons unleashed against them. The bottom line from this speech, in very simple terms, is that it’s all about the geopolitical chess game with Iran. Who will shout “checkmate” first is anyone’s guess. Hayat Alvi, Ph.D., is an Associate Professor in the National Security Affairs Department at the U.S. Naval War College. The views expressed are personal. “’As we watched the efficient attack on Assad’s National Security council on Wednesday, Assad found himself one minister of defense and brother-in-law short. Interventions have been taking place in the 17 month old conflict since its inception, and the only issue now is for those who have picked their horse – in this case, the unpredictable, unknown creature called the Syrian opposition – to bide their time. This is a quote from an online blog called “Above Top Secret,” which includes analysis from Stratfor Intelligence (a private open-source intelligence firm). I was also recently quoted for a Reuters piece on Syria speculating the same thing: that the sophisticated bombing successfully taking out key senior officials in Assad’s inner circle could not have happened without outside help, as well as an insider turncoat. It was indeed a spectacular attack that has shaken but not collapsed the regime. The alleged outside support, which I am coining “Neo-Interventionism,” is not new or unique to the Middle East, especially in terms of supposed covert assistance being given to Syrian rebels. However, this neo-interventionism is unique in the sense that the outside supporters of the opposition see Syria as a means to undermine the Iranians. And, as much as some are profusely denying that a sectarian component exists in this scenario, it is clear as day that the backing of the opposition by conservative Sunni / Wahhabi Saudi Arabia, and Qatar, is imbued with the Sunni-Shiite rivalry and geopolitical, regional, and ideological competition. No one would be happier to poke the Iranian regime in the eye, and pull the rug out from underneath them, more than the Saudis and their allies, which includes Western powers. Yet, many scholars, analysts, media, and regional and Western powers are conveniently turning a blind eye to this and a few other uncomfortable truths. Among these is the fact that the Saudis and Qataris are not involving themselves out of the goodness of their hearts. They see a golden opportunity here, but with gross disregard to the regional risks and perils that such neo-interventionism harbors. Part of my neo-interventionist theory is that old lessons from history are never learned, and the parties involved are bound to repeat history, like the civil war in Syria that is very similar to the civil war in Lebanon (or will ultimately morph into such). The only difference is that now there are some new actors involved in new contexts. The configurations and in some cases even the grudges remain unchanged. Another uncomfortable truth is that atrocities and crimes are being committed by both the Asad regime and the opposition rebels. Robert Fisk of the Independent reports at least 200 women outside of Homs have been raped by both sides, and the actual numbers of victims could be much higher throughout Syria. Extrajudicial killings and kidnappings are also taking place. Yet another uncomfortable truth is that no one actually knows the composition of the rebels, and that among them are some unsavory characters, including hard-line Salafists, criminals, and drug addicts. If there is a lesson to learn from it’s the case of Libya, which is still a mess and where violence and kidnappings continue to plague society. But, Libya is nothing compared to Syria, especially with the potential for spillover of the civil war into Lebanon. If we think the case of Libya is turning into a transitional nightmare, then we must brace ourselves further for Syria’s civil war, as well as for the uncertainties pertaining to the post-Asad era. There is much speculation about what a post-Asad Syria would look like, but another uncomfortable truth is that the likelihood for power struggles, sectarian cleansing, ideological spats, and chaotic violence is very high. There is no doubt that the Syrian civilians are suffering, including refugees fleeing to neighboring countries. They deserve security and protection, and a long-term solution for the future health of their country. In my opinion, the Asad regime and the rebels are disregarding the plight of the civilians caught in the middle of the conflict zones. And, the rest of the world is impotent, except for the neo-interventionism, which is myopically pursuing respective national interests, rather than genuinely concerned about the innocent non-combatants. If either side – whether the Asad regime, the opposition groups, Free Syrian Army / rebels, and the foreign supporters – really cared about the Syrian civilian population, they all would stop what they are doing right now, lay down their arms, and sit at the negotiating table. Obviously, they each have their own agendas for Syria and possibly the region, and their actions show that the civilians are pawns and dispensable entities. Syria can end up becoming the Middle East’s Afghanistan. It doesn’t seem to matter to them who gets in the way. What’s happening now in Syria is increasingly complicated. Urban warfare is difficult and costly, as countless civilians pay the ultimate price for indiscriminate shelling and armed attacks in residential areas. Numerous YouTube videos continue to show such indiscriminate shelling in residential areas. A severe humanitarian crisis is emerging in some Syrian cities. In other words, Syria is now the “rumble in the jungle” for a number of external powers, seeking to realize their own interests and agendas for a post-Bashar al-Assad Syria. I wrote about this in a previous blog post, “The Saudi Specter in Syria and the World.” What this means is that Syria is now the multidimensional chessboard for internal and external players, not unlike the case of the Lebanese civil war (1975-1990). “Dempsey identified ‘a Sunni-Shiite competition for, you know, regional control,’ of Syria being played out between Saudi Arabia and Iran as a key barrier to U.S. intervention, as well as Damascus’s ‘very capable’ military. They have a very sophisticated, integrated air defense system. They have chemical and biological weapons. They haven’t demonstrated any interest or any intent to use those, but it is a very different military problem,’ Dempsey said, noting he had not yet been asked to provide U.S. military options on Syria. Therefore, the cyber battle and diplomatic maneuvering all mirror the ongoing conflict inside Syria. This is an example of modern, literally multidimensional conflict, which includes cyberspace. Sadly, what gets lost in the messages is the ability for the rest of the world to extract the “TRUTH” behind the rhetoric and fog of war. Moreover, as an international affairs analyst, I cannot fail to be mindful of the parallel crisis involving Iran’s nuclear program, and how elements of the power play between all of these players are seeping into the Syrian jungle. Gen. Dempsey referred to Iran as a “rational actor,” in terms of how the regime calculates its courses of action. That’s the basic presumption of state actors in international relations, but often states cross the line of rationality, like Assad’s regime, in the zeal for power and power projection. In the end, they only end up looking like bloody-fanged hyenas.